I’ve never seen so much cheese. Over a week ago I began a month-long road trip from Pennsylvania to the western United States. My trip has taken me to Lake Erie through Ohio, to Michigan and then to northern Illinois, to Iowa, through Nebraska and now Wyoming. While in Illinois I was so close to Wisconsin that I just had to divert from my planned course to see what all this talk of cheese is about. Wisconsin’s welcome center is near the state line in Beloit just off Interstate 90. They have tons of useful maps and brochures along with knowledgeable staff ready to point out interesting facts and locations that someone passing through on the interstate might otherwise miss. One of the first things they proudly handed me was a map showing 161 locations throughout the state all related in some way to cheese. Since Wisconsin dairies produce over 600 varieties of cheese and their dairy farms average 100 cows per farm, most of which are family owned, I guess having a map of cheese locations is useful. With my new map, I set out in search of places where I could taste some cheese. As it turns out I didn’t really need the map. I hadn’t even driven 30 minutes north where I saw a huge sign towering over a service station with the word “CHEESE” prominently displayed over bright yellow at the top of the sign. The Wisconsin Cheese & Wine Chalet sells just about any kind of cheese you can imagine –– Garlic Brick, Veggie Cheddar, Cajun Colby, 8-year Cheddar, 3-year Cheddar, 2-Year Cheddar, Tomato Basil Farmers, Caraway Havarti and much more. There are blocks of cheese, cheese curds, slices and spreads. In just a few minutes I went through about 20 toothpicks savoring only a half-dozen different cheeses. I now understand why people miss the cheese when they move away from here. Just 50 miles west of Beloit is Monroe, known as the Swiss Cheese Capital of the United States, where I visited the Alp and Dell Cheese Store. Connected to the Roth Kase Cheese Factory, those visiting the store can also tour the factory and view a short video on making cheese. There are also plenty of samples to try. Since I arrived in the early afternoon and most of the work happens in the morning, there were no scheduled tours. But I was lucky. Some workers were finishing up one last batch and they let me go back to a small viewing area where I could see them in action and later watch the video. It’s also not surprising that a state that claims to have as many cows as school children would have plenty of cheese-themed restaurants –– like Baumgartner Cheese Store and Tavern. Open since 1931 and specializing in cheese sandwiches, it’s one of the oldest cheese stores in Wisconsin. Since I already had my fill of cheese at the last two stops, I ordered a smoked brat instead – covered in cheese. If you can take your mind off eating for a moment and look up, you’ll see clusters of dollar bills pinned to the ceiling. Donated by customers, the bills are taken down at the end of each year and given to charity. And tasting cheese isn’t all there is to do with cheese in Wisconsin. You can also view a 300-pound hanging Wisconsin Provolone at the Tenuta’s Delicatessen and tour the Mars Cheese Castle in Kenosha. Alan Murray is Uncharted’s president. 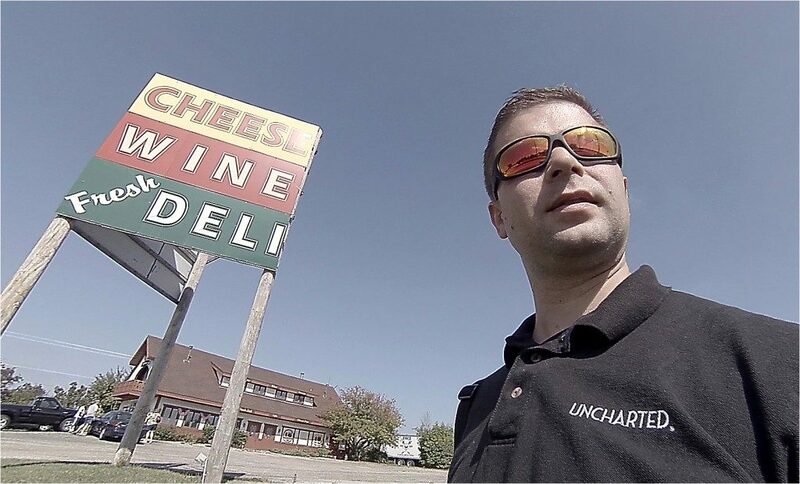 When Uncharted’s new online community of explorers is ready you can help Alan by visiting Wisconsin and sharing about your adventures tasting cheese. Sign up and we’ll let you know when it’s ready.